Welcome to one of Oklahoma City’s best kept wedding location secrets. We aren’t a wedding chapel, but we are a cozy Victorian inn located in the heart of the city. One of the things we enjoy providing is a romantic and intimate wedding in a historic Victorian inn setting. Come take a look at our unique setting, antique furnishings, and pick the perfect spot for your vows today! A wedding to remember: Perfect intimacy and ambience together in one package. It couldn’t be any better on that special day here at the Grandison Inn. You tell us what you want and we’ll put together what you need down to the last napkin. You can add as much or as little as you want to the basic price. It’s your day and we want to help make it as perfect as possible. So take the stress out of planning and putting together your wedding and let the Grandison handle all the details. Leaving you free to handle all the joy, fun, love, and special memories of the day. Make the day (and night) even more special by renting a room with your wedding. We’ll give you a discount on your room for having your wedding onsite, and you can relax, soak in the tub, sip some bubbly; or visit with special friends while all the hustle goes on downstairs. Then when the ceremony and festivities are over, you can slip away quickly to peace and quiet, lean back in your Jetted Tub-for-two, enjoy soft music, candlelight and love. It just doesn’t get any better. Up to 1 Hour use of parlor. Use of parlor and dining room. 4 Hours for setup, cleanup, reception, ceremony. $75 per hour additional if scheduled. $150 if you exceed 4 hours without scheduling. Use of parlor and dining room. 4 Hours for setup, cleanup, reception, ceremony. $75 per hour additional if scheduled. $150 per hour if you exceed 4 hours without scheduling. We can host larger weddings outside utilizing our side and front yards, porch, etc. Please contact us for details and pricing. If you require tables/chairs/drapery for tables, we can help! Ask us for a referral. 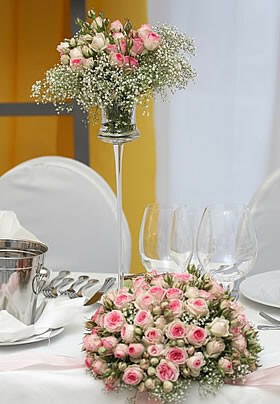 You are responsible for cleanup of centerpieces, decorations, etc after the wedding/reception. No nails, tacks, or damaging decoration devices please. You are given 4 hours use of our facility for setup, cleanup, etc. You may schedule more use on your contract for $75 an hour, otherwise, you will be billed at $125 an hour for unscheduled overages. 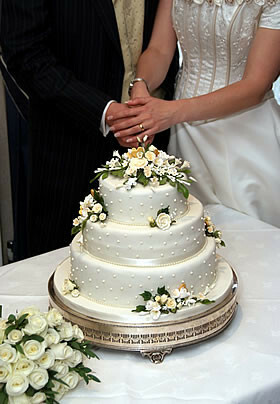 We love making our business and our home available to you for the celebration of your union. However, as it is our personal residence and we do provide this space to our overnight guests; We ask that you adhere to our 4 hour scheduling practice unless arrangements have been made prior to your wedding day. Also, we reserve the right to bill for excessive cleanup and damages to the property.